Everyone loves to go buy a new home in Tucson AZ. Selecting the cabinets and flooring for their Tucson new home. Making all the new home design decisions. However, in all that excitement don’t forget, there are a few things that you need to know before signing that purchase contract. A Tucson new home builder’s interest is represented and protected by their onsite new homes salesperson. This onsite new homes salesperson’s sole responsibility is to the Tucson new home builder and the builder’s financial best interest. The new home sales-representative may or may not be a licensed Realtor®. If so, they will explain to you about “disclosed dual agency” and their responsibility to both new homes buyer (you), and seller (new homes builder). The non-licensed sales agents are well trained, nice, and helpful. But make no mistake, they solely represent the Tucson new homes builder. Contract Negotiation – MyOwnArizona New Home Realtor Agents are there to protect your financial interests. When it’s time to write, negotiate, amend, and review a final contract on your newly built home in Tucson, you need a licensed MyOwnArizona Real Estate Agent on your side, looking out for your best interests. 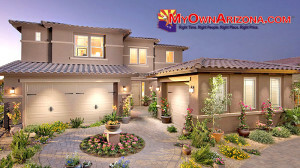 Selections – MyOwnArizona New Home Realtor Agents help you understand where many builders have added their profit. MyOwnArizona New Homes Agents are certainly not against anyone making a little money for their hard work and expertise, but, we can show the buyer on the selections lists where someone is doing more “padding” than necessary. With an MyOwnArizona new homes agent’s advice, you will make better choices on upgrades, always keeping in mind your lifestyle, resale, and neighborhood continuity. Monitoring Progress – MyOwnArizona New Home Realtor Agents physically travel to the Tucson build site. If you are unable to visit the construction site, agents will email you pictures of the progress and notify you of issues. The construction phase is extremely important and MyOwnArizona New Home Real Estate Agents must monitor the building process and report back to you. At critical points of the project (foundation, pre-drywall, and punch out phases) it is recommended that you have an independent contractor with years of experience walk thru your home with you. Dispute Resolution – In the event of a dispute with the Tucson builder over cost, build time, work orders, etc, you need the backing of a strong MyOwnArizona New Home Real Estate Agent. You need the experience of someone who has “been there & done that” and understands the process and can explain what is “normal” and “reasonable” throughout this interesting time. Warrantee Reminders – All new homes have different warrantee periods for different components on the Tucson new home. For example, drywall may be 12 months and window may be 60 months. MyOwnArizona New Home Realtor Agents take a copy of your warrantee binder and capture all the key warrantee dates and discuss them with you. You can do all this without an agent, but you will be really glad to have your MyOwnArizona New Home Realtor Agent there. An extra set of eyes and experience. So, when you add it all up, a lot of services are provided at NO COST to you! Please feel free to contact us and we can provide you with additional information on all of the locations; pricing, floor plans and lot availability. We can also schedule appointments for you to view any of our new homes communities in Tucson. We look forward to hearing from you and working with you soon!